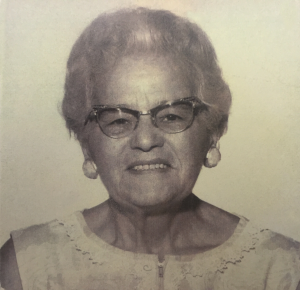 Mary Grillo, aka “Grandma Mary” was born in Pennsylvania to Italian immigrant parents in 1896. When she was just a toddler, a disgruntled nephew murdered her parents (he put dynamite under their bed). Mary and her two sisters weer sent back to Sicily to be raised by their aunt and uncle. When Mary was 16 her older brothers paid for her and her sisters to move back to America. A few years later she married Giorgio Zampaglione (who eventually changed his name to George Sample since no one could pronounce his name), and they had four children. They owned a small convenience store attached to their home in Bakerton, Pennsylvania (near Johnstown), and raised four children in the rough and tumble coal country. Their son Tony and his wife Carolyn moved two hours away to West Virginia and had four children of their own. When their youngest (Rob Sample, co-owner of Mother’s Bistro & Bar) was born, and since they were both working and could use the help, they invited Mary and George to move into their home in Kingwood, West Virginia. Mary and George moved in and Mary happily took over the cooking, delighting everyone in the family. When Rob was around twelve years old, Mary and George moved down to Florida, but would return to Tony’s house for the summer to get away from the Florida heat. Grandpa planted a garden full of tomatoes, cucumbers, and “googootz” (zucchini), while Grandma Mary made bread and pies weekly and cooked her specialties for family dinners. Her children and grandchildren remember her food fondly, drooling as they recall some of her best dishes. Rob remembers helping her pound the meat for the cutlets and shaping the meatballs for the sauce. His eyes sparkle when he talks about how she’d fry up some of the leftover breadcrumb and egg mixture into a patty and give it to him as a snack. He recounts stories of how he and his siblings fought over leftover meatballs and stovepipes (rigatoni), resorting to guerrilla tactics when necessary to get their fair share. Grandma Mary was our very first Mother of the Month in January 2000, and we felt it befitting that we honor her as we celebrate our sweet sixteenth year. She was loved for many reasons, but forever remembered for her cooking.